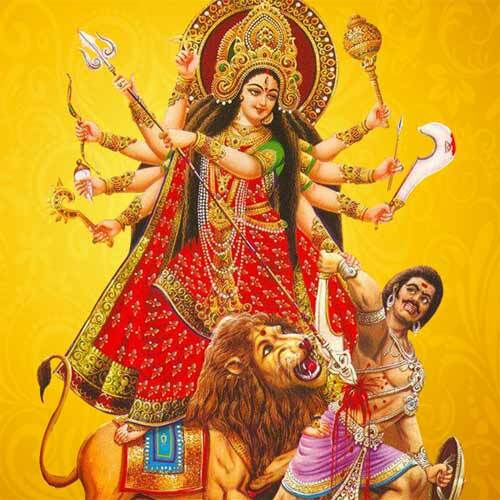 Manas Puja of Goddess Durga means worshipping Durga in the mind. She is given a place in the heart of the devotee. The devotee then meditates on Her. Puja Vidhi and all rituals that you wish to do are performed in imagination. This is considered by many people as the finest form of Durga worship. There is a close contact with the Goddess in Manas Puja. There is no intermediator. How to do Manas Puja? After taking bath, sit in Padmasana posture in a quiet place. It is now time to quieten the mind by shutting out all forms of thoughts. Then start to meditate on the Goddess. Close the eyes and think of Goddess sitting on the lotus of your heart. Once you realize the presence of Mother Goddess, converse with Her mentally. Next if you wish, you can make your offerings, perform rituals and pujas mentally. Some devotees hum the mool mantra of Goddess Durga. The puja ends when you are content. You then engage in daily chorus but with a firm conviction that Mother Goddess is residing within you. There are no mistakes, rules and rituals in this form of worship. You interact with Goddess personally. Mental purity is all that is required.